Happy humpday, we're getting there. And it's going to be a long weekend, so just hang in there! Today we're looking at short-sleeve sheer sweaters, in particular, cardigans. They're a great transition piece for summer into fall when you want to add a super light layer to an outfit. A beautiful color and very easy to belt to define a waist. A preppy sort of sheer. 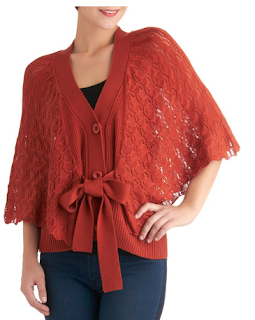 The dolman sleeve is also a great detail to add to this cardi. Love this open weave knit! So simple and delicate. And the price is spot on. A pretty v-neck style, makes this the perfect late September cardigan. Short sleeve cardigans are so easy to mix into your wardrobe, but the open knit, or gauze style is even easier to wear when it's still warm out. Cute cardigans...I've always wanted to order stuff off modcloth! I will have to give it a try.